Rabbi Jon-Jay Tilsen has been the spiritual leader of the Congregation since 1993. A native of Mendota Heights, Minnesota, he is a graduate of Columbia College in New York, where he studied Political Science and Middle Eastern Languages and Cultures. He received a Masters degree and Rabbinic ordination from the Jewish Theological Seminary in 1991. While in Rabbinical School he studied in Jerusalem for three years. 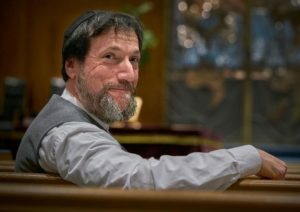 Rabbi Tilsen has four children, and resides in the Westville neighborhood of New Haven. Rabbi Tilsen is a member of the Rabbinical Assembly, the global organization of 1,600 Masorti-Conservative rabbis, and of the New Haven Area Rabbinical Assembly, the local organization of Masorti-Conservative rabbis.